It’s a small part of a big book, but I want to start by saying that I like how David Anthony Durham handles his map. We know what The Tough Guide to Fantasyland has to say about maps: that to see one at the front of a book is to know that you must not expect to be let off from visiting every damn place shown on it. At first glance, Durham does not disappoint. Indeed, he opens with a tour, in which an unnamed, pale-skinned assassin rides out from a stronghold in the North, down across the frozen plains of the Mein plateau, down through the fertile woodlands of the Methalian Rim; he then passes through the port of Alecia and boards a boat for the island of Acacia, seat of the empire that dominates the Known World, and home of his target, Leodan Akaran, the king. At each stage the culture and climate of the region through which the assassin is passing are described, along with the darkening colouration of its inhabitants. It’s a smooth introduction to a slice of the world, and it shapes our understanding of the rest of Book One of The War With The Mein (which is itself Volume One of Acacia), also known as “The King’s Idyll”. The next two hundred and fifty or so pages focus primarily on the seat of empire, and there introduce the main cast, each in their own chapter: Leodan himself, aging widower king; his chancellor, and “first ear for any secret” (32), Thaddeus Clegg; his four children (in descending order of age), noble Aliver, brittle Corinn, precocious Mena, and innocent Dariel; a talented Acacian general, Leeka Alain, stationed in the assassin’s homeland; and Rialus Neptos, scheming governer of the fortress where Alain’s army is barracked. A few players remain to be introduced — notably Hanish Mein, brother of that assassin, leader of his “tribal, warlike, bickering” people, and architect of a multi-pronged invasion that stuns the Acacian empire with its speed, ferocity and thoroughness — but you get the idea. This is a story of princes and princesses, soldiers and battles, empires and destinies. With what can only be called, despite its chunkiness, admirable economy, The War With The Mein covers years and a continent. It asks us to learn (and think about) a lot, and by the end of it, we have travelled to each compass point of The Known World. It is, oh, what’s that word? Epic. Many chapters begin with this sort of thing. These are characters who are not allowed to keep very many secrets from their readers; the nuances of their emotional progressions are laid out in careful detail, meaning that if there is sometimes suspense about what exactly they are going to do, the cumulative effect is that we almost always know with piercing clarity why they act. More, this is how Durham gets in a lot of his background. Every sentence in the above paragraph is about Leodan, but most of them are telling you something about how he feels about the world – how he has been shaped by it; in The War With The Mein this is far more common than the reverse – and thus telling you something about the world. There is also a greater-than-average amount of diegesis, or put another way, a relative lack of direct speech (and hence, banter: none of your Scott Lynch snap here) and direct action (there’s a bit more of this, particularly late on, but, for example, the first major battle of the war takes place off-screen), to the point that I don’t think it would be entirely unfair to suggest that The War With The Mein is interested in its characters and their inner lives less for their own sakes, and more for the light those lives can shed on their roles as historical agents. These are, the novel appears to say — thanks to the aesthetic choices that shape it, as much as in any explicit sense — the people by whose actions this world will be turned: now watch it turn. The story of Books Two and Three of The War With The Mein (“Exiles” and “Living Myth”) is largely the story of how the royal children come to terms with having their perspective shattered: how they come to terms with knowledge of their inherited guilt, and of the true shape of the world. Though we never leave the map’s boundaries, “The Known World” is, as we may have suspected, very far from being the Whole World. The slave trade that supports Acacia is managed by a commercial organization, the League of Vessels, on behalf of a people, the Lothan Aklun, who appear on no Acacian map. Hanish Mein’s invasion is only a success because he negotiates new deals with these powers. We will turn to them, presumably, in the second and third volumes of the trilogy (volume two, out later this year, is called The Other Lands, though there are reasons internal to volume one to understand that some form of exploration is inevitable), but in the meantime we begin to appreciate that the Known World is not nearly top dog. And every time we check a location, the map at the front of The War With The Mein serves as a reminder of how incomplete the story told so far really is. Absent that reminder, it would be easy to get lost in the sweep of Durham’s story, because Durham really is good at sweep. So: the royal children are spirited out of the capital as the inevitability of Mein victory becomes apparent, dispersed to various corners of the empire to be raised in secrecy. Three of them make it. The fourth, Corinn, is recaptured and held in a gilded cage by Hanish Mein. Of the others, Mena washes up on an island in the East, hailed as a living incarnation of the local goddess of wrath; Dariel joins the pirates of the West, harrying the League of Vessels and others who ply the same waters; and Aliver is sent to one of the tribes of Talay, in the South, where he becomes a warrior, and a leader. There are adventures and excitements in all four strands of the story, for the most part executed with some flair. In another review I would pay more attention to the vigour that Mena and Aliver, in particular, bring to their fighting by fusing their arthritic Acacian “forms” — literally rehearsals of famous conflicts — with the techniques of other cultures. “Unlike the forms”, we are told, the new style of warfare that Aliver must learn “allowed no actions not entirely necessary” (284). In that other review I might suggest that part of Durham’s project with Acacia is to infuse the forms of epic fantasy with a similar energy. In this review, however, I will point out that it is another way in which Durham is economical: we only get the full Mary Gentle blood-and-guts fury late in the book, when it has most impact, in part because the characters are not capable of giving physical voice to their anger until then. Sometimes, certainly, economy works against the book, such as when Mena goes from swordfighting neophyte to winner of the local tournament in one chapter (chapter forty-seven, thirteen and a half pages), but at other times it is incredibly refreshing. A raid by Dariel on one of the League’s mighty trading platforms, for example, is similarly conceived and executed within a single chapter, and all the better for it, while Aliver’s inevitable quest sees him set out in one chapter and arrive in the next. This isn’t just a matter of pacing; the sense is that there is a lot of story here that could be told, a lot of canvas to be covered, and that (as with the map) Durham is being very selective about what he’s showing us. So what we do get carries weight. All races are one? Aliver asked. All races of the Known World are one, Nualo said. Forgetting this was the second crime done by humans. We suffer for it still. No zealot like a convert: Aliver is driven forward by a vision of dramatic reform: “He, when victorious, would not rule over them. He’d rule for them. By their permission and only in their interests” (613). The Lincolnesque tone there is unmistakeable, surely, and stirring. Nor is the attack of the white-but-powerless Mein against the brown-but-powerful Acacians as straightforward a revision as it seems: the Acacian empire is set up in such a way as to sustain the power of one race over others, but (as it turns out), the blind mechanisms of the state don’t much care which race is pulling the levers. Hanish finds “the Acacian template the only reasonable, achievable answer” (320) for many situations; the institutions, once created, are resistant to change. Indeed, we are told that Hanish’s rule is rather worse for the average citizen than Leodan’s was. So much for the actions of a few turning the world. Or so you might think. But all of this is talk on behalf of a general populace whose absence leaves a ragged hole at the core of The War With The Mein. There is no street-level perspective in this book. Certainly, as I mentioned, the Akaran children all have their privilege challenged by their exile. For Mena, the challenge comes as she flees, and is confronted by the desolation and cruelty of an enormous mine run by her family. “Clearly,” she realises, “the world was not as she had been led to believe […] Those people, those children … they worked for her” (327). Dariel, meanwhile, is the most sympathetically inclined of the children from the start, being the youngest and having befriended some of the palace staff even before the trouble starts. But entering Talay, on his way to join Aliver’s crusade, he finds himself disoriented by the polychromatic display that leaves him feeling that his brown skin is “weak tea in a sea of black coffee” (494). “Nobody looked at his features and read his identity on his forehead”, he realises. “How could he be central to the workings of the world when nobody even knew who he was?” (496). And Corinn faces the realization that her dark-skinned features, so beautiful to her countrymen, are unappealing in the face of icy Mein standards of attractiveness. Yet each of these incidents is extremely limited, and none of them feel lasting. Mena becomes a goddess, moving from one privileged position into another; Dariel is back at his brother’s side, back at the heart of events, within pages of the above doubts; and although Corinn never fully loses her outsider status, she does find that she is attractive to at least some of the Mein. (The relationship that results is not the most successful part of the novel — indeed, neither Corinn’s story nor Mena’s is impervious to feminist critique. But they are well-done iterations of their kind, and may develop further.) It all leaves the grand sentiments of equality espoused by Aliver ringing slightly hollow. A story about the inadequacy of a model of history based solely on the actions of Great Individuals cannot get by only telling the stories of the elite, even if it is to reveal that, in the bigger picture, they too are constrained. While reading the book, this does cause problems. It gets repetitive to be told that the Akarans (or at least Aliver) are fighting on behalf of a mass of people we don’t know, and whose plight we are to a large extent taking on trust; and at the same time, there is something unavoidably patronising about such a fight, for all Aliver’s tentative yearning towards a more democratic social order. Moreover it leaves some of the detail of the current social order – precisely how it sustains itself – vaguer than is desirable. But all this may be deliberate. I am more than half-convinced that it is, that the social gap in the book is part of the contract made, intended to be as keenly felt as the geographic vacuum within which these events take place. The War With The Mein appears to stop at a natural ending – the Akaran lineage is restored, and the Mein are vanquished. But this is, as an epilogue makes clear, a metastable situation at best. The relationship between Acacia and the Lothan Aklun has changed and will have to be addressed. But by all rights, the internal politics of the Empire will also be thrown into disarray. No trade with the Lothan Aklun means no Mist, and no Mist means that at least some people should be thinking about Aliver’s dream. So the end of The War With The Mein is an end that requires more story, and more radical change, to complete its argument. There are hints that Durham is well aware of this — a revelation that the characters we have become invested in are not the centre of the story would seem to be foreshadowed by the demonstration of the limits of their control; and Aliver is seen by at least some people not as a saviour but as a “lesser evil” — and it is Mena, once again, who asks the pertinent question. “Are we going to make a better world?” (682). I hope so. I want to believe so. I want to know what happens when the Whole World is the Known World. Because the map thing isn’t so small after all: to say that I like how Durham handles his map is to say that — so far — I like how he handles his world. Great review! Makes me want to read this book again, also makes me vaguely ashamed of my own reviews. NIT-PICK ALERT: Also from the first paragraph: “…scheming governer of the fortress where Alain’s army is barracked…” I found the use of “barracked” a bit awkward as “billeted” or “garrisoned” would be the first verbs that come to mind. Pingback: Fantastic Acacia review « King of the Nerds!!! Ooh. I think I’ll buy this. Excellent review of an extraordinary book. 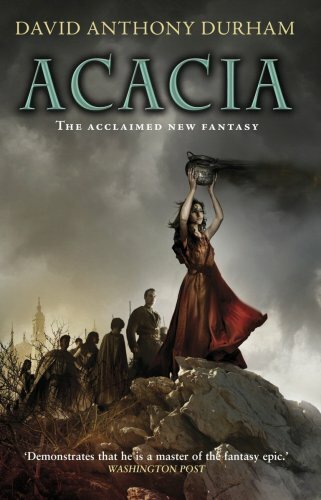 If you want to learn something about power and betrayal the I highly recommend to read Acacia. Can’t wait to read the next book of the series – The Other Lands – which will be released in September 2009. Thanks, Mike and edifanob — it’s always good to know others recognise the book I’m describing. Mike, would you believe I actually dithered between “billeted” and “barracked” there? I went for the latter in the end because I liked the harsher sound of it. And Lasair, I hope you enjoy the book; I really got a lot out of it. I’m convinced that every good review finds their reader – sooner or later. in order to spread the word. Well, that’s very good of you.